I love quinoa. It is my favorite ‘grain.’ It technically is a seed, not a grain, and is related closely to beets and spinach. Quinoa is pronounced KEEN-wah. It is a great addition to any gluten-free diet. Quinoa is generally grown in South America in mountainous regions but recently some farmers have begun looking at growing it in the United States. It can tolerate high altitudes, drought at some points in its growth cycle and a range of temperatures, so it’s generally an easier crop to grow. It’s well-known as the grain of the Inca Indians in the Andes. It grows in places other grains and crops will not grow. Weston Price observed that quinoa was a special food for nursing mothers in the Andes because it was high in minerals and stimulated milk production. As ‘grains’ go, quinoa is one of the best. It is 18% protein, which is high for a grain, and it is a complete protein. It has magnesium, folic acid, iron, B vitamins, Vitamin E and calcium. It is free of gluten. When soaked and cooked, it becomes fluffy and it has a nice texture difference between the germ and the seed. It can also be sprouted to improve the nutritional content. Quinoa has a nutty-earthy flavor. It is cooked just like rice and it makes a great rice substitute in dishes if you are rice intolerant or you just need a change of pace. Quinoa comes in a few different colors and they have slight flavor differences. 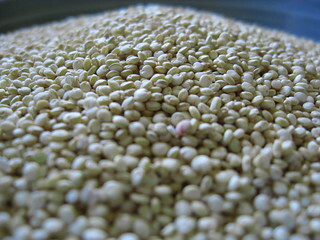 Quinoa can be coated with saponin, a naturally occuring substance that protects the seed from birds- saponin tastes bitter. It is easily rinsed off of the grain. Most companies that sell quinoa in the US pre-wash the quinoa to remove it. When you get the quinoa home, give it a quick rinse before using it if the bag says it was pre-rinsed. If not, place it in a sieve and rinse it well under cold water. Quinoa should be soaked before you cook it, as you would with other grains and seeds so you can absorb their nutrients. Quinoa does best with a longer soaking time. According to Food Phytates by Reddy and Sathe, soaking quinoa for 12-14 hours at 68 degrees reduces phytic acid by about 70%. If you add a little lactic acid bacteria in your soaking medium and soak up to 18 hours, you can reduce the phytic acid by up to 88%. I accomplish this by using whey or a dash of my lactofermented brine to the acid I use for soaking. In a bowl, whisk together the quinoa, water and lemon juice. Because quinoa clumps, you’ll need to whisk hard while pouring in the water. Cover and soak up to 24 hours. When you’re ready to cook, drain the quinoa in a sieve and rinse it well. Place in a saucepan and cover with the stock or water. Add the salt. Bring it to a full boil. Cover, reduce the heat to low and cook for 15 minutes. Pull it off the heat but do not open the lid and allow it to sit for 5-10 minutes. Uncover, fluff it with a fork and you’re ready to serve. Next week we’ll look at some versatile ways to use quinoa beyond a plain grain side dish. Photo by Jason Holmberg on Flickr. I use quinoa, but never processed as you have. I will try it this way. Thanks. One of my favorite recipes is to toss in some pesto when it is done cooking. My favorite new dish! I’ve had several people tell me to try it with pesto in the last week. As soon as the basil starts rolling in, I’ll give it a whirl!